Tesla’s latest software update 2019.8.5 takes the ‘Navigate on Autopilot’ feature on a whole new level, the car can now make lane changes all by itself, without confirmation from the driver as was the case previously. It was only October last year when Tesla enabled the full 360° view of the vehicle by activating all the 8 cameras of the vehicles that came out of the factory after August 2017 i.e. equipped with the Autopilot Hardware 2.5+. With the activation of the 360° view came the new feature ‘Navigate on Autopilot’ which basically was intended to make highway cruising in a Tesla vehicle less tiring — now a Tesla could change lanes and take the on-ramp and off-ramp by itself but only when the driver confirmed the move. 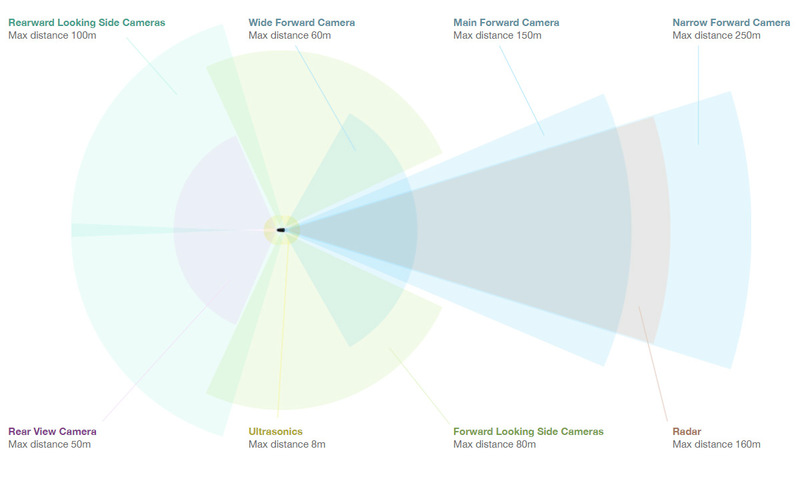 We can see how an HW2.5+ Tesla vehicle is equipped with a forward radar, 12 ultrasonic sensors and 8 cameras in the above infographic — the only difference in the latest HW3.0 is Tesla’s own proprietary ‘Full Self-Driving Computer’ replacing Nvidia Drive PX2 supercomputer for more power and performance. 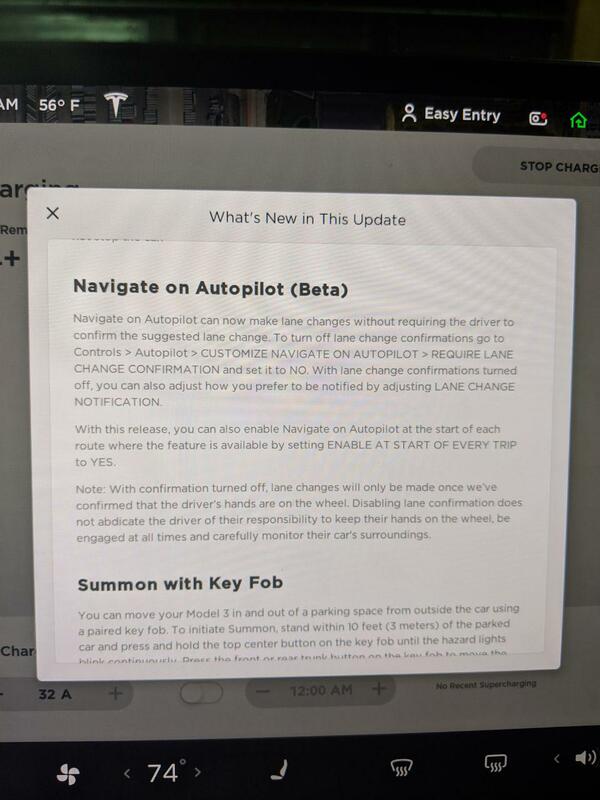 Although Tesla Inc. released a detailed blog post about the new and improved ‘Navigate on Autopilot’, let’s break the information into segments and take the help of some videos for easy understanding, especially for new Tesla owners who are growing in number each day. Tesla vehicles are unique in many ways but the main distinction from the traditional cars is that Teslas are equipped with a computer for Autopilot and related features and a Media Control Unit (MCU) for the infotainment system — Tesla updates the software for both of these computers by providing over-the-air updates from time to time. These over-the-air updates are free for Tesla owners for life — this is how Tesla cars constantly get new features and improve the existing ones, even Tesla can remotely fix the braking distance of the entire fleet by tweaking the software and pushing the update. Since this is a to-and-fro situation, the entire worldwide fleet of 550k+ Tesla cars sends back important data and visuals to the ‘Tesla Neural Net’ at the company’s HQ, enabling Tesla vehicles to learn from each other’s road experience, this giant dataset has now more than 1 billion miles of fleet learning recorded. Let’s learn by a small example: If 1000 Tesla drivers have traveled from San Francisco to Los Angeles (383 miles), the Tesla Neural Network has the data on this route for 383 miles x 1000 times = Tesla Autopilot has the experience of this route traveling 383000 miles — according to Tesla the ‘Navigate on Autopilot’ feature has been used for more than 66 million miles. This massive fleet-wide learning of highway navigation has finally developed the confidence in the software to take the next step, Tesla vehicles changing lanes without driver’s input, all on their own. 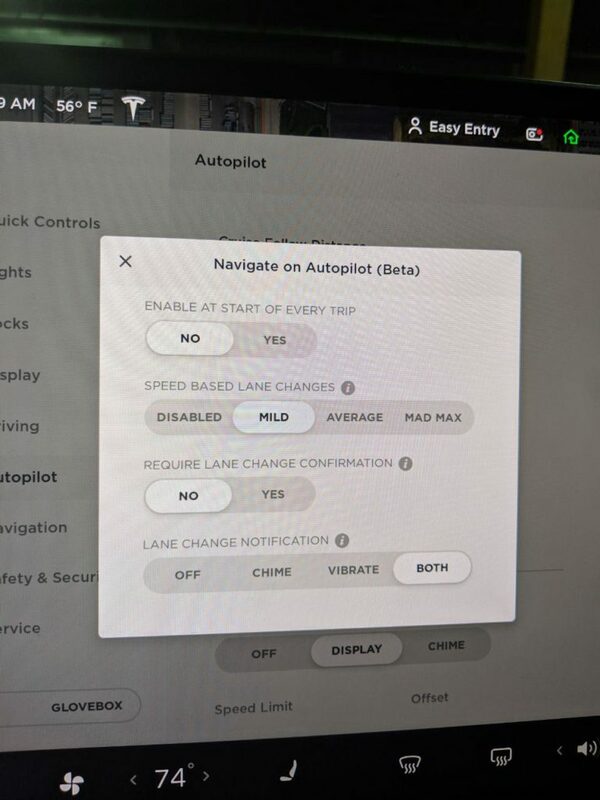 In the previous version of the ‘Navigate on Autopilot (NoA in short)’ feature, the driver had to confirm a vehicle suggested lane-change by pressing the turn stalk, now the more seamless or advanced NoA needs no confirmation to change the lanes but Tesla still managed to keep things easy for regulator approval and keep drivers responsible for the behavior. 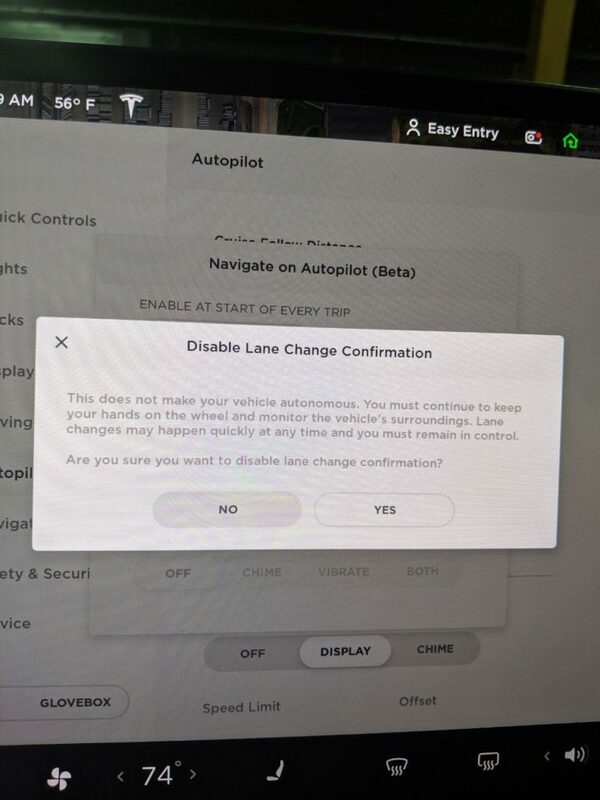 Although there is no need to confirm the lane change the feature requires you to keep your hands on the steering wheel, otherwise, the car would not make the lane change. Navigate on Autopilot can now make lane changes without requiring the driver to confirm the suggested lane change. 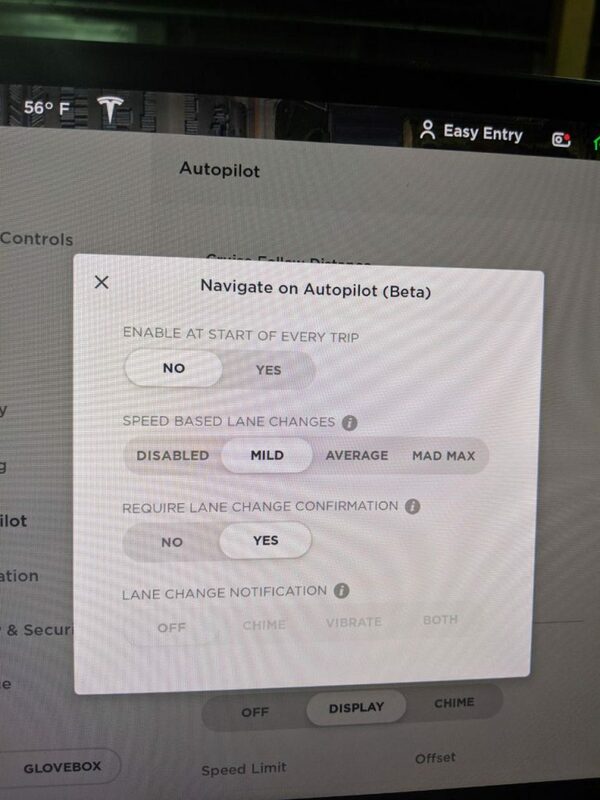 To turn off lane change confirmations, go to ‘Controls > Autopilot > CUSTOMIZE NAVIGATE ON AUTOPILOT > REQUIRE LANE CHANGE CONFIRMATION’ Set it to NO. With lane change confirmations turned off, you can also adjust how you prefer to be notified by adjusting LANE CHANGE NOTIFICATION (see screenshots below). With this release, you can also enable Navigate on Autopilot at the start of each route where the feature is available by setting ENABLE AT START OF EVERY TRIP to YES. Note: With confirmation turned off, lane changes will only be made once we’ve confirmed that the driver’s hands are on the wheel. Disabling lane change confirmation does not abdicate the driver of their responsibility to keep their hands on the wheel, be engaged at all times and carefully monitor their car’s surroundings. Besides checking for driver’s hands on the steering wheel, the vehicle performing auto lane change also gives an audio notification with a chime and optional steering wheel vibration to alert the driver (check controls in screenshots below). Car looks for a slightly turning force on wheel (direction is irrelevant) to confirm that driver hands are on steering wheel before initiating lane change. Just a precautionary measure until we have a few billion miles/km of real-world lane changes with reliability >> human. The feature is available for Tesla customers who previously bought the ‘Enhanced Autopilot (EAP)’ or have currently bought the ‘Full Self-Driving’ software package for their Tesla Model 3 and Model S and X manufactured after August 2017. Above: 2019.8.5 release notes and settings screenshots, courtesy of u/slilonsky13. Click/Tap images to load high-res versions. Teslatunity takes his Tesla Model 3 for testing the new and seamless Navigate on Autopilot feature, by looking at several user reviews and videos online, the 2019.8.5 software update has nailed it!